There are just so many things I love about the Stampin' Up! set, Nature Walk. The row of eggs and the bird (a robin?) especially appealed to me. All the images are so beautifully rendered. One of the things I did when mounting the set (I own the wood mount set) is to cut the row of five eggs into individual eggs, and mounted them as individual stamps. While I did like the row of eggs -- so neat and orderly -- I decided that they would be much more versatile (to me) as separate images. As evidenced in this card. of the card, creating a much less formal look. from Layered Labels (page 103 of the big catalog), The Open Sea (page 104 of the big catalog), Creative Elements (page 126 of the big catalog), Oh Hello (page 4 in the Spring Catalog), or Beyond Plaid (page 14 in the Spring Catalog). The technique used to get the effect on the center panel is referred to as masking. It is a ridiculously easy way of having one image appear to be behind the foreground image without covering up any of the main image. Fold a 5 1/2" x 8 1/2" piece of Soft Suede card stock in half, creasing well with a bone folder. On a 4 1/4" x 5" piece of Bashful Blue card stock, stamp the eggs randomly all around the edges, making some of the eggs Soft Suede and the others Early Espresso. After the eggs are stamped around the edges, run this piece through the Big Shot inside the Square Lattice Embossing Folder. Sponge all edges with Soft Suede ink, then pounce the sponge here and there softly on the rest of the background. Set aside. the writing surrounds the cage? This is called masking. Adhere the cage piece to a 2 5/8" x 3" piece of Early Espresso card stock. Attach this to the embossed piece with a Stampin' Dimensional in each corner and one in the center. oval punches, but one is now retired. I would recommend using the Word Window Punch for this word.) From a scrap of Early Espresso, punch out an oval (or the Modern Label Punch). Adhere these pieces together. Tap the blue with the inky sponge. Cut a slit on both sides of this label. Slide a piece of ribbon through the slits, centering the sentiment. Attach the ends of the ribbon on the back of the background panel with Scotch Tape. Adhere finished panel to card front. REMEMBER Sale-A-Bration (until March 22)!! For every $50 you spend (before shipping and taxes), you can choose one of the items from the Sale-A-Bration brochure for FREE! There are 18 free things to choose from! Don't forget to name me as your demonstrator so you get the best possible prices! Pretty! 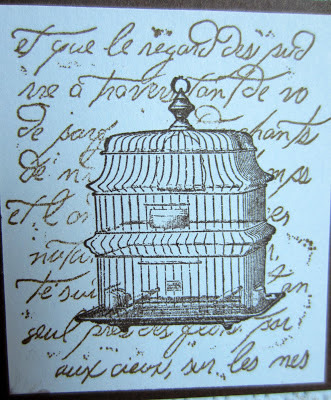 I love the design of the bird cage and words! I love your card. Cutting apart the eggs is a great idea! Wow your are a great artist, I love your blog. Kisses from Spain. You are a great paper artist! Gorgeous card! I love it! The soft colors are fantastic! Cute card:) I am your newest follower from the hop! I have you had a great weekend. Great card! 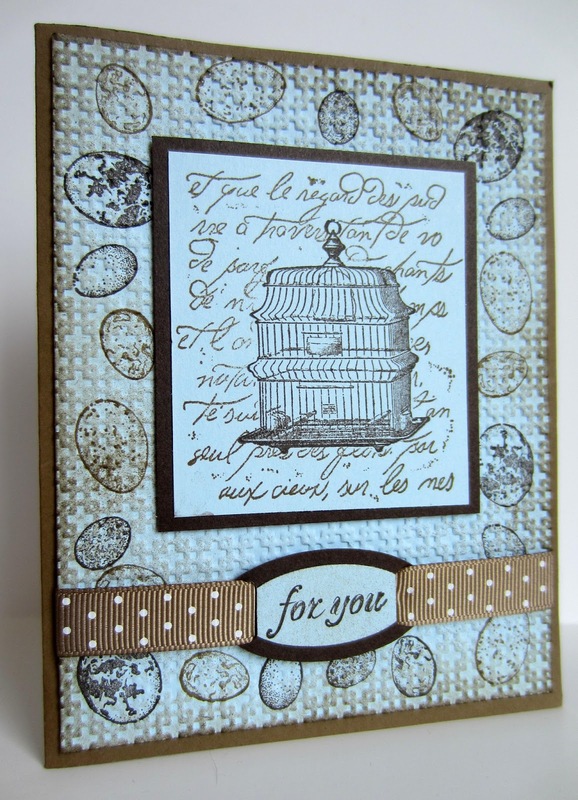 Love the way you masked the words to add your birdcage on your card! I am linking over from The Answer is Chocolate where I've linked too. WOW at first glance I thought it was a quilt. That is amazing. Thanks for sharing with us at "In and Out of the Kitchen Link Up Party" with Feeding Big. Love that bird cage stamp. I like the way you laid out the graphics on the card. I always get inspired to pull out all my stamps and ink when I see your works of art. OK...maybe Now I will do it...if I can ever get my room completed! I kept the paper and stamps and ink all out so I could do so!! 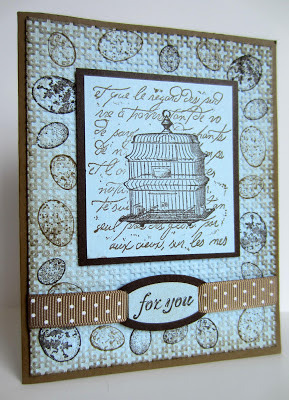 Love this card...and you are brave to cut a stamp set apart....I cant even bring myself to cut a piece of lace!!! Oh, this is my favorite on so far!! I have a major love for birdcages, and this is gorgeous. You are so creative and inspiring. Thank you so much for sharing with us at A Bouquet of Talent this week. :) Hope you are having a great week.